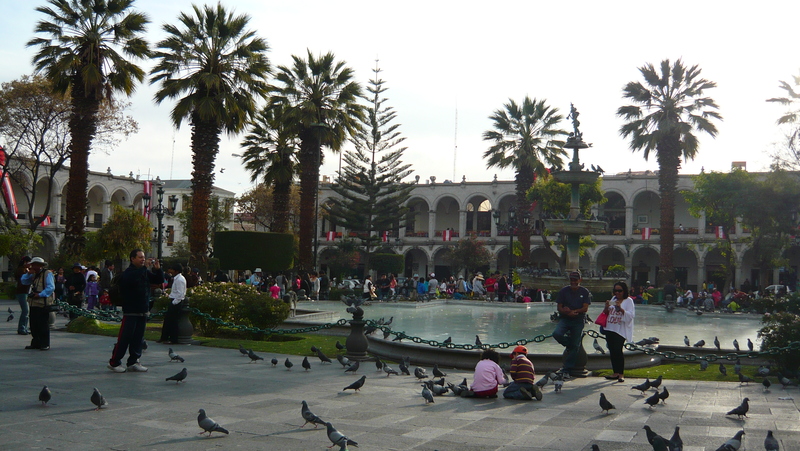 Wednesday, 31 July 2013 was my last of eight days in beautiful Arequipa, Peru. It was a fairly laid back time. Every day was lovely and sunny; just like a nice summers day back home in New Zealand. I was staying at Samana Wasi hostel. I had booked a single room for two nights because they didn’t have dorms and a single room at this hostel was much the same price at 19 soles as a dorm anyway. I was shown to a room that had three beds and an ensuite. Apparently all the single rooms were full. I didn’t mind being upgraded as long as it wasn’t costing me more. 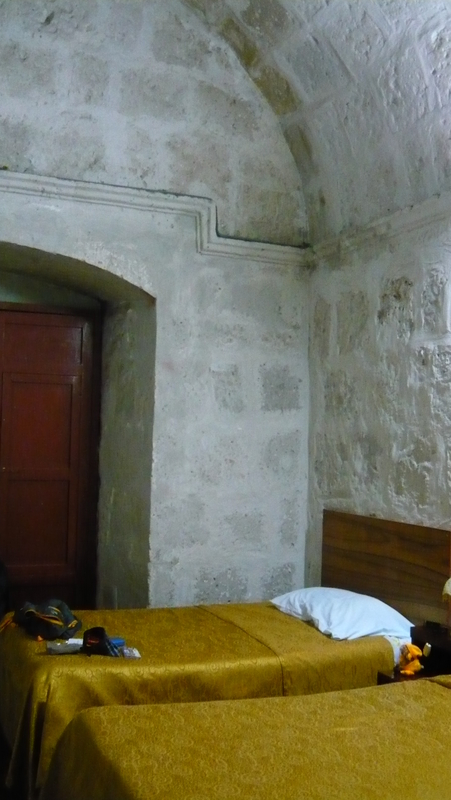 The room was made of the volcanic stone that a lot of Arequipa is made from. It smelt rather musty and the surfaces of everything were filthy. At least it had a desk, I could get wifi in the room and it also had a TV. The breakfast that was included is excellent – a fried egg (or half an avocado), two large bread rolls, fresh fruit juice, butter, jam and tea. Read more on my hostel review page here. The first day, I did my usual wander around the city. I was sitting in Plaza de Armas and looked over to see a familiar face looking at me. I could hardly believe it, of all the places in the world to bump into Samuel again. 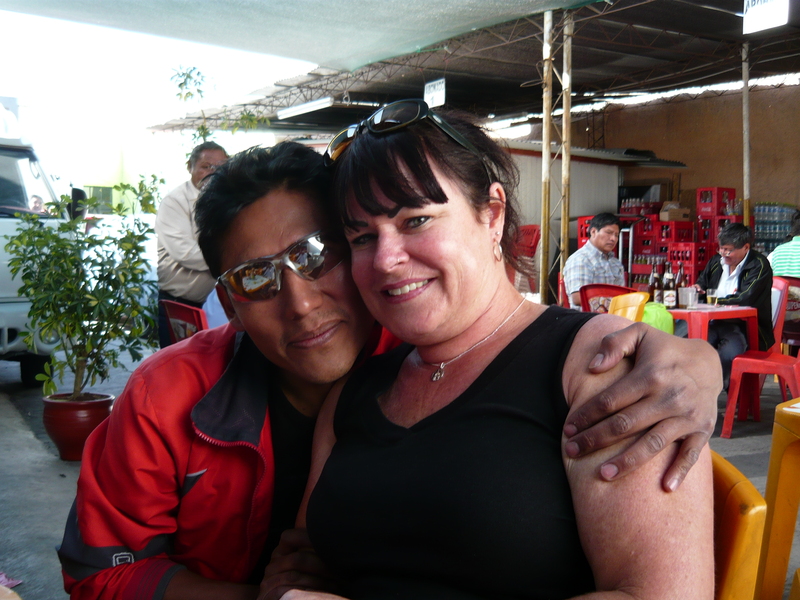 I had met Samuel three years ago when I was in Cuzco. He had taken a fancy to me and we kept in touch through Facebook and Skype. He is a street juggler and has no money. For some reason I ended up paying for meals and bus tickets. I figured at the time, I didn’t really mind because he spoke good English and showed me places that tourists don’t know about. We had a bit of a falling out about a year ago when I hadn’t heard from him for ages and he contacted me saying he was stuck in the Amazon and could I give him some money. I was really furious and told him how rude it was to ask me for money. He couldn’t understand my annoyance and deleted me as a Facebook and Skype contact. He was very apologetic about what had happened. I was determined this time, if he wanted to hang out, then he would have to pay for himself. He showed me some more of the town and I got attacked by mosquitos. They are more vicious than the mosquitos at home and I came up in big red blobs that swell up…not pleasant at all! I can’t believe how far my money is going in Peru, compared to Chile. I went to the supermarket and got 2 litres of water (you can’t drink the tap water in Peru, unless you want to get sick! ), loaf of brown bread (up until now, all I have found is white bread), 2 tomatoes, 1 litre of milk, cracker biscuits, red onion, green tea, drinkable yoghurt (I love it), all for about NZ$13.00. My cough isn’t any better so found a Farmacia (pharmacy) and she sold me six Azumet tablets which were quite expensive really at 30 soles (NZ$13.50). I just hope they work. I decided to stay in Arequipa a bit longer so booked a few more nights. I had to move into a single room because the large room I was in was booked. The room I moved to was quite sunny and didn’t smell musty. It was rather small but at least I had a desk, wifi and a TV. The bathroom was just outside my door and I seemed to be the only one using it. I was getting really annoyed at constantly asking for “baño papel” (toilet paper) though! They also didn’t empty the toilet paper bin until I asked them to, nor did they clean the bathroom the whole time I was there. 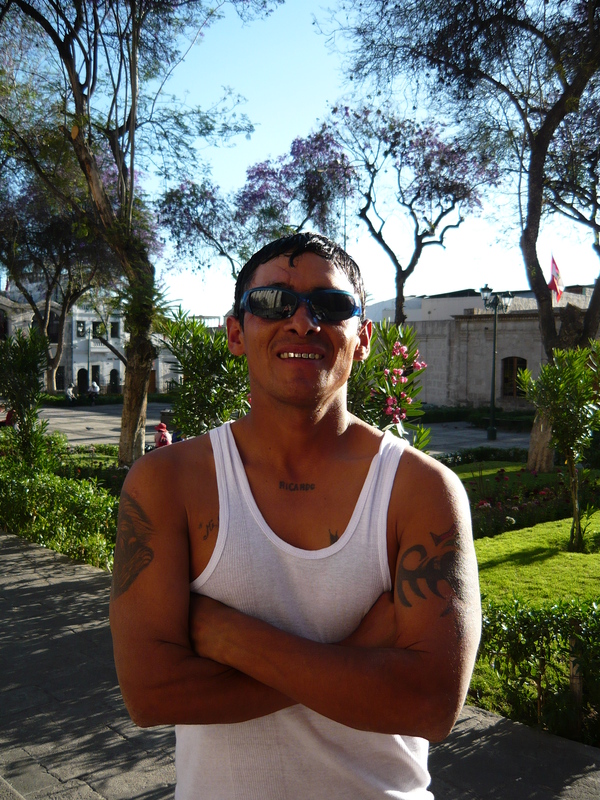 The next day I was to have met Samuel in Plaza de Armas. I waited for half an hour but he didn’t show. Typical of South Americans! They have no concept of time. 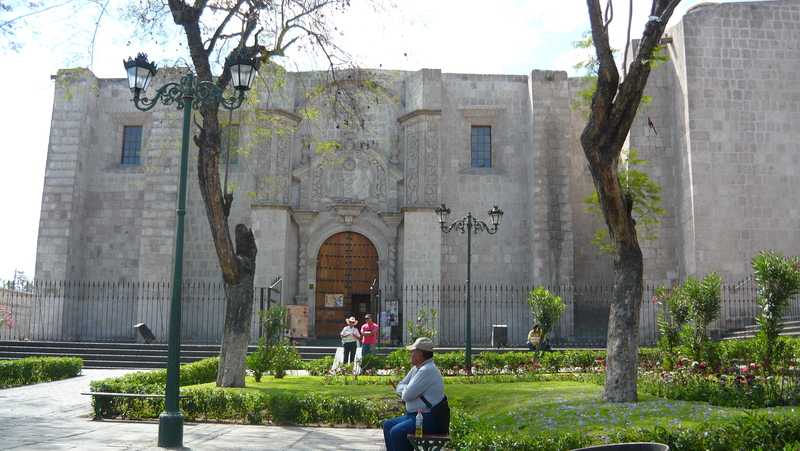 I decided to go and visit the Museo de Arte Virreinal Santa Teresa. The entry was 10 soles (NZ$4.40). I had read that if you had an English speaking guide you had to tip them. I was offered a guide and declined. However, this lovely young man said he didn’t mind. I asked him how much he expected as a tip and he said nothing, it was included in the 10 soles. I thought, well why not then? There were a lot of religious paintings and sculptures. The techniques were really interesting but I can’t say the paintings or sculptures appealed to me. The church and the grounds were the only place I was allowed to take photos. If you want to see a lot more photos, then click here for a link to photos on the internet. I had just left the museum and was taking a photo across the street, when next minute, these two guys were chatting to me. I had no idea what they said at first. When they discovered I spoke English, one could speak a bit and the other couldn’t speak any. They asked me to go for a drink and I thought, yeah why not? We went to this back street ‘bar’ where I was the only woman, apart from the waitress who had huge breasts that were just about falling out of her t-shirt! I don’t normally drink beer so they ordered me an Inca Cola. It is bright yellow and rather sweet. However, I did end up partaking in the beer ceremony which was interesting. They would pour a bit into a glass and drink it then the glass and bottle got passed to the next person and this continued. There was a jug that the froth left in the glass got tipped into. More often than not, they would just tip it on the concrete floor. Ernesto (who was rather a hottie) took me to have some ceviche. They had run out of it so we had a similar version that had quite a bit of liquid and was served in a glass and had a slice of sweet potato in it. It was really delicious. Hung out with him for the rest of the day and later went to a chifa and had a typical Peruvian meal of rice, fried bits and pieces and chips. It was a huge plate of food for only 6 soles (NZ$2.60). There was some kind of rehearsal for something in Plaza de Armas. I guessed it may have been something for Peru Independence day that was coming up on 28 July. We listened and watched that for a while, then Ernesto walked me back to the hostel. He asked for my number but I don’t have a local SIM card. He does have my email address so hopefully he will email me. I was starting to get into a routine of having breakfast, doing my Spanish lesson, catch up on Facebook and emails and in the afternoon going to a small Plaza called San Francisco. I would either do another Spanish lesson or catch up my diary. It was amazing how many guys would go past and say “hola” (hello) and/or come and talk to me. They couldn’t speak English but with my limited Spanish, there seemed to be a common theme…what is my name, where am I from (they are always really impressed when I say New Zealand, they probably expect me to be American), did I smoke weed and did I want to go have a cerveza (beer). It was so funny. One named Ricardo (he had his name tattooed on his chest, must have been incase he forgot his name! ), the only English he knew was “hello baby, I’m crazy for you”. I just laughed, who teaches them this English? The Peruanos are definitely a lot more outgoing and friendly than the Chilenos! One day a girl came and sat near me in Plaza San Francisco and I could see she was reading some English lessons books. I got up the courage to ask her “disculpe, tu estudiar English?” (excuse me, you study English?). She said yes and came over and we had a bit of a chat, but it was kind of difficult because she didn’t really know much English but we went through a few things in her book. I even discovered that one of her books had errors in it! How is that helpful to someone learning English? Samuel asked if I wanted to go and have lunch one day. I said I wanted to have ceviche. It is divine and very healthy! I thought, “he better be prepared to pay for himself!” We found some out of the way cevicheria and got the set menu. It started with a fruit juice and fried corn that is like a nibble. I am addicted to it. Much healthier than having potato chips. Next we had a very watery seafood soup but it was very tasty. Then came mini ceviche served in two shells. For my main I had ceviche which was awfully hot, but oh so good. It’s not often as hot at this one was. 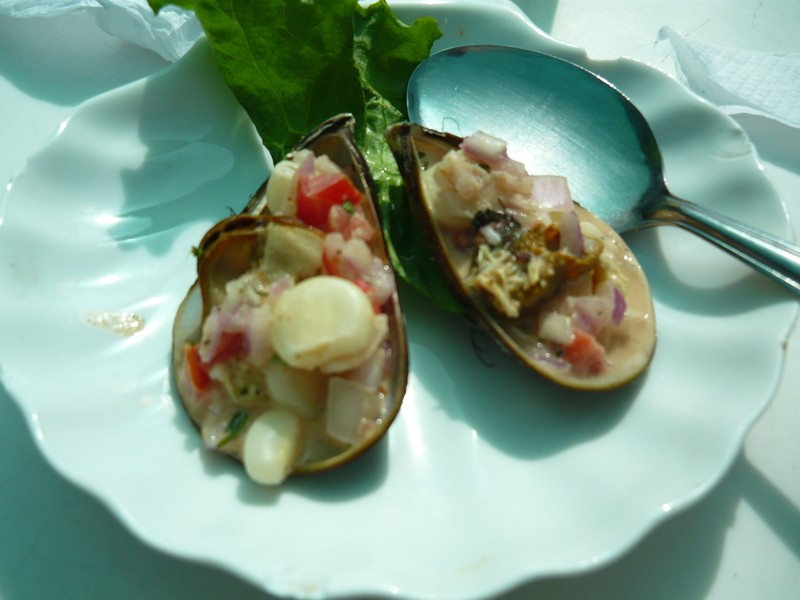 Click here to read more about ceviche and discover some recipes. Samuel had fried seafood with rice. My meal was 17 soles (NZ$7.50). I’m pleased to say that Samuel did pay for his own. The other touristy thing I did was visit “Museo Santuarios Andinos” where the famous mummy of “Juanita” is housed (Juanita is also my daughter’s name). It was 20 soles entry (NZ$8.80), plus they tell you you have to tip the guide. It started off with a really interesting 20 minute video all about her discovery. She is the best preserved mummy ever found in Peru. Because of the high altitude her body was frozen so her organs, fluids, skin and clothes are really well preserved. It was terrible to hear how these young boys and girls were sacrificed to the Gods at such a young age. You can read more about “Juanita” by clicking here and watch a short video below about “Juanita” and a couple of other Incan mummies. After a bit of research and tossing up between Ica, Pisco or Paracas. I decided my next stop would be Paracas. I managed to book a Cruz del Sur bus that goes to Lima via Paracas. This time, because it was a 12 hour trip, I decided I would spend an extra NZ$13.00 and get a cama (bed) which is downstairs in the bus and there are only 12 seats. Cama seats were 150 soles (NZ$66.00). 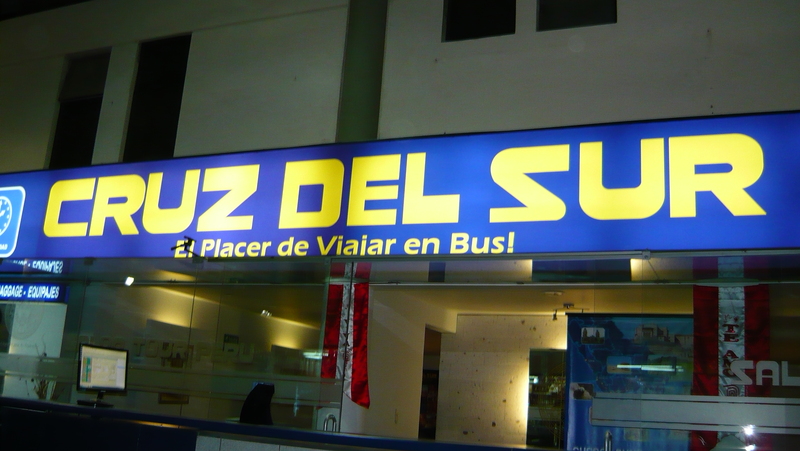 I could have booked online via Cruz del Sur but didn’t have any way to print my itinerary. I did find out later that as long as you have your booking number, you just go and get your ticket at the Cruz del Sur office. I found a travel agent that booked buses. Fortunately I had checked it all out online because the guy who didn’t speak English had booked me on a bus to Ica and it was only 115 soles (NZ$50.00) and this just didn’t feel right. Fortunately there was another guy there who could speak English and he sorted it out. I got a taxi to the bus terminal for 7 soles. It was 2 soles cheaper than from the terminal to the hostel when I arrived so I guess the holidays must have finished. He dropped me at the roadside because from what I could gather it was another 3 soles to be dropped at the entrance of the terminal. It was only a 50 metre walk. The Cruz del Sur depot was the best yet. They had a lovely departure lounge. I was so glad I spent the extra on a cama seat. They were nice big seats and I managed to get a reasonable night’s sleep. We were served dinner which was horrible…hard cold over-salted rice with some kind of chicken stuff that was also cold, an apple cake thing that was burnt on the bottom and some other mysterious thing that tasted good. I could have had tea or coffee but declined because they had no leche (milk). That is quite normal in South America. I guess everyone must drink their tea and coffee without milk. I also had a screen in front of me that had internet access, albeit rather slow, a choice of movies and music. I watched Taken 2 which was fortunately in English with Spanish subtitles. Often they are dubbed in Spanish so I can’t watch them. Thanks for dropping by, my next blog will be about my adventures in Paracas. My journey from Arica, Chile to Arequipa, Peru on 23 July 2013 was an interesting one. 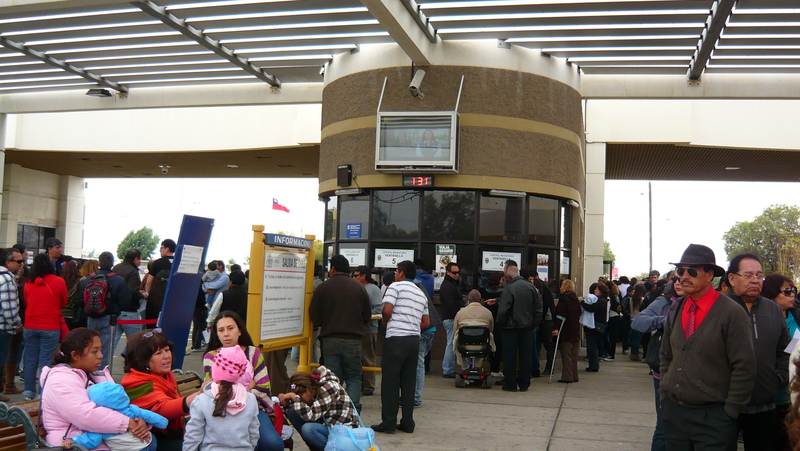 I walked to the bus station and after paying 250 Chilean pesos tax (NZ$0.60 – have no idea what kind of tax it was), I then had to stand in line for about an hour to wait for a colectivo (taxi) that ferries five people at a time across the border to Tacna, Peru. The trip is 400 Chilean pesos (NZ$9.70), but because I had a heavy bag I had to pay 600 Chilean pesos (NZ$14.50). I was in a taxi with a Chilean couple, a young Peruvian guy and a lovely older Peruvian lady who could speak really good English. She had worked as a tourist guide for a year. It was so helpful having her on this trip! At the border control, because it was winter holidays, it was extremely busy. A lot of Chilean’s go over the border to Peru to buy cheap items. 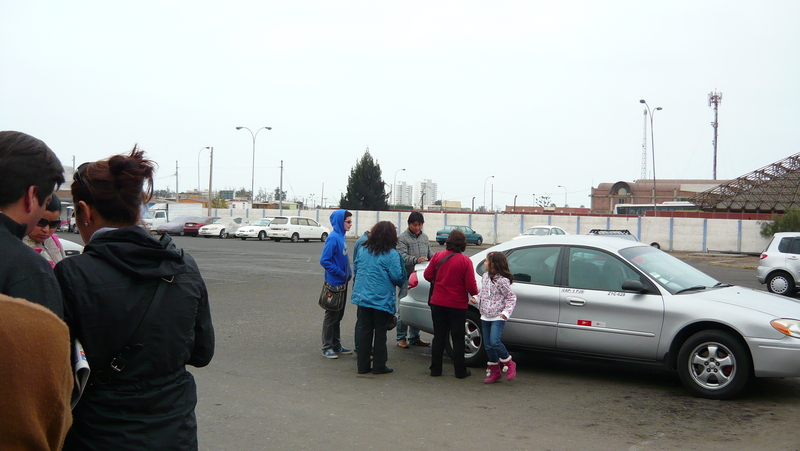 The young guy was sent to stand in line to save our place while the car slowly got nearer where the driver could park. Once through the border control, we had to go to the car, get our bags, go back to the office and put our bags through the x-ray machine. I thought it was all over and we would soon be in Tacna…wrong! We had to go through some other kind of control after that and the queue was huge! We got dropped off at the national bus terminal. I had been told I had to cross the road to the International bus terminal to get a bus to Arequipa. First thing I needed to do was get some Peruvian sols from the ATM. Before I know it, I am falling into the old trap of getting hustled to get a bus to Arequipa! All I heard was “Arequipa”. Yes, that was me! This guy who could speak very little English leads me across the road and he’s trying to tell me the time the bus is going. However, I’m no good on the times in Spanish yet, so it meant nothing. I guessed from the rush, it was leaving soon. We got to the counter of the Moquegua buses which looked nice in the picture so that was a relief. My bag was being pushed under the rail to get it on the luggage trolley. I had to say “espere” (wait) because I didn’t even know the cost! It turned out it was 20 Peruvian sols (NZ$9.00). That was ok, then he escorts me to another counter where I had to pay tax of 1 Peruvian sol (NZ$0.44). We then go back to the bus counter and I’m told I have to pay more because of my heavy bag! He said he would take Chilean pesos and it would be 2,000 (NZ$5.00), more than half the bus ticket cost! He just stuffed it into his pocket. I’m sure I got ripped off on that one. Then the guy who hustled me wanted a tip (it’s all coming back to me now, you NEVER get anyone to help you with anything, unless you want to give them a tip). I had a few Chilean pesos so gave him some of them. I had a window seat and lucky enough not to have anyone sit by me the whole way. We seemed to stop a number of times just in the middle of nowhere for no apparent reason. One place however, was like a bus check. An official got on and was collecting all the locals’ identification cards. I just had to show my passport. We had to get off, walk through the building to the other side of the gates. The luggage hold of the bus was open, they seemed to be doing a good old check. After about 10 minutes the gates were open and the bus was allowed to proceed. 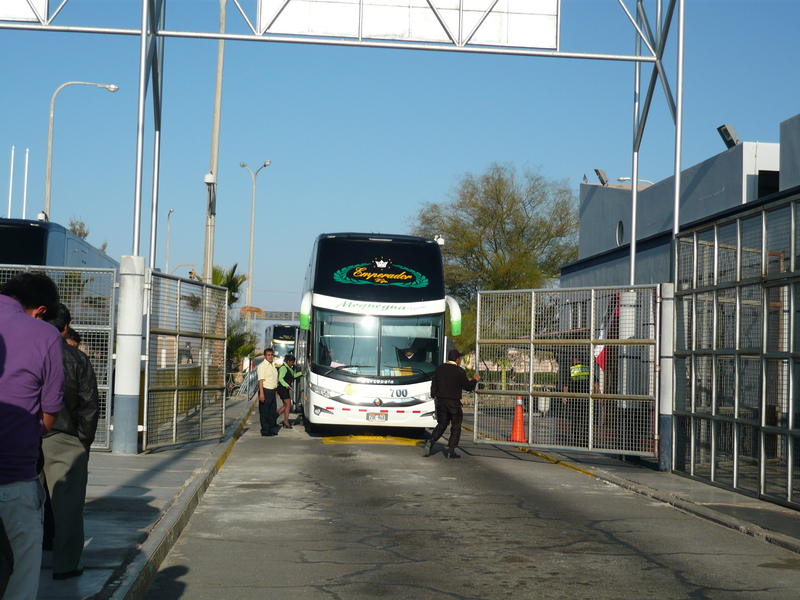 After six hours in a semi-cama seat, I arrived at Arequipa bus station. I had been warned not to get a taxi outside the terminal because they are renowned for taking you somewhere and robbing you. There were several legitimate taxi drivers at the entrance to the bus terminal. I asked one “cuanta cuesta” (how much) and showed him the address of the hostel. He said 10 sols. The hostel had said it should only be 5 – 8 sols. I said to him it was too much. He pointed in the direction of outside the terminal and I guessed he was saying I could get cheaper if I wanted to go outside. But of course I didn’t, because I was likely to get robbed! I walked away and composed myself and then went back and asked another driver. He also said 10 sols but we ended up agreeing on 9 sols. I was to find out later, because it was the holidays they charge more! At least I got to the hostel safely.